Anhui Province is located in southeast China. It is crossed by rivers Huai and Yangtze. It covers 139,000 km² and shares borders with 6 other provinces. The population is estimated at over 60 million. Thanks to its rich cultural heritage and the rurality of its landscapes, Anhui has become one of the most touristic regions of China. Mountains and hills extend over approximately 2 thirds of the territory. 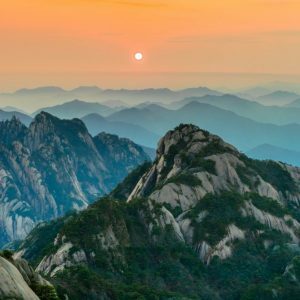 Several treks or hikes can be organized in the heart of different mountain ranges: Jiuhua, Langya, Qiyun, Tianzhu and especially Mount Huangshan. The pines scratch the sky, the cliffs are steep and hot springs are nestled here and there. The ascent of these peaks will make you discover a nature that lives simply and that makes you aware of its immensity. Many villages in Anhui Province have been declared World Heritage by UNESCO. Xidi, Yixian, Nanping or Hongcun are certainly the villages that knew how to best preserve the authenticity of the constructions of the Ming and Qing dynasties. Visitors are invited to integrate into the daily life of these local ethnic groups. The county of Shexian is full of ancient architectural examples, especially in Tangyue where magnificent porticos have survived the past years. The city of Hefei, capital of the province, is also renowned for its historical monuments and temples. To reach Anhui, the plane is the fastest option since Huangshan is connected to Shanghai, Canton, Beijing, Xi’an and Hong Kong. Rail and road networks are also very well developed. This allows you to move without much difficulty inside the region. The installation of cable cars has in addition to this facilitated access to the summits. When to travel to Anhui? The average annual temperature varies between 14 and 17°C. The colors of the forest and the mountains are resplendent in spring and autumn. We therefore advise the months of April, May, June or September, October, November for a stay in Anhui. Nevertheless, the snow lovers will be enchanted during the winter because the mountains then take another dimension. Where to sleep in Anhui? Famous thanks to the Huangshan Mountains, Anhui is full of places to stay. You’ll have something for every budget, from small B&Bs of incomparable charm to large hotels located in the city center, near the main sites to visit, or in the surrounding countryside. That’s why we have selected for you the best hotels in Anhui, combining comfort and quality of services.